"Do you still have abs?" Whoever commented this, i am sorry but i have to laugh. I sure hope i still have abs, otherwise i wouldn't be able to run, stand up straight, workout... live life, be alive? Everyone has abs, though not everyone has visible abs and in all honesty. Who cares if your abs are visible or not? Serisouly, there are far better things to worry about than having visible abs and this is something which i have thankfull learned in life. 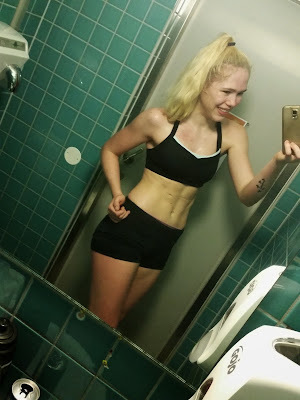 After having a long period of wanting to have visible abs, wanting the defined 6 pack abs and realising that 1) i would have to sacrfice alot of food to get them, as well as limit my social life. 2) be more controlling over food and exercise and 3) most probably not function well at all as well as most likely triggering ED thoughts. As well as being someone who firmly believes in loving your body as it is. Not focusing on changing your body, but loving your body and if you want to make improvments such as health wise, strength wise, different types of progress etc, then thats just great. 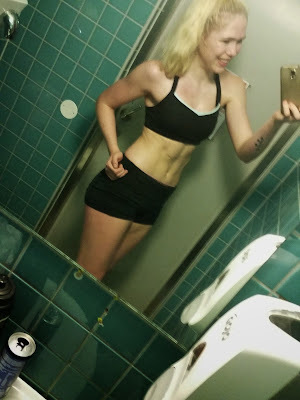 But i believe in learning to love your body, and i focused on that instead of visible abs. And now i am so much happier! Because really, who see my stomach anyway? Myself and my boyfriend and my family when i decide to walk around in shorts and a sports bra at home (which is like 90% of the time, haha). But really, even when i wear crop tops at school and such i dont really care. I bloat, my stomach is a normal stomach and it bloats. But i do still have some type of lines, though trust me..... they are only there 5% of the time! And even if i may have a 'flat stomach' (though trust me, it really isnt that flat), i am SO MUCH more than that. I am my personality, my strength, my mind, my thoughts, my hobbies and interests. My day does not depend on how my stomach looks, my food intake does not depend on the size of my stomach, my life does not revolve around my core. If i eat what is healthy for me, what my body works well with (though i still eat alot of foods that cause me bloating or foods which might not be the best for my body, because well.... Sometimes you just gotta take the bad with the good! ), do the form of exercise i enjoy, drink enough water, sleep enough as well as have mental health days and social time then i am healthy and happy, which is the MOST IMPORTANT! I tried finding some type of 'stomach' picture but really... i never take them anymore. The picture below was a rare picture taken a few days ago, a first time in several weeks. No... some of it is missing behind my shoulder ;);) But i am going to cut my hair soon! What if you would feel more comfortable and "stronger" and healthier if you had a flat stomach with abs and not flab hanging over your bikini bottom? Could you, who trains hard, builds a lot of muscle, eats healthy (no burgers, chips, pizza, doughnuts or any other form of junk food) and takes a lot of pictures posing and flexing honestly say that you would be happy if you were 15kg heavier with no muscle tone and stomach rolls over your bikini bottom?? It's just hard to believe that you or anyone else would. I love your description of me because it is not accurate of me at all ;) Trust me, you really dont know how i eat and yes i eat burgers, chips, pizza, ice cream, chocolate etc... i dont exactly post everything i eat. And i can honestly say i rarely take 'posing/flexing pictures'... i might flex an arm sometimes (hahah) but i dont exactly post stomach pictures everyday or even every week, its not necessary. THe important thing to remember is that your body has a healthy set point, a weight that is where your body is healthy at. And that is the weight i am which is what makes my body healthy as well as taking care of my body properly. If i were to gain 15kg... i dont know how i would feel. I wouldnt be at my healthy weight then, so i am pretty sure that my body would start showing signs or signals saying that... this is not my healthy weight. But everyone has different healthy set points, and some people find that they feel alot better when they have gained some weight compared to being just above healthy BMI. However i dont find its so helpful to focus on weight, if you know that you are within your bodies healthy weight range then that is what matters AND how you treat your body. If you are using unhealthy habits to try to be a certain weight which isnt your healthy set point then its not your healthy weight. If you can eat normally, live normally +/- exercise and keep your weight then its a healthy weight for your body... for example if i were to lose 10kg just to weigh less it would not be a weight i could maintain as i would have to eat very little, just like if i were to gain 15kg i would have to eat extreme amounts which wouldnt be very healthy either. I dont even know where this answer is going anymore, haha, so i am just going to cut it here! Yeah i do, on the back of my legs. It was something i used to hate alot because i thought i am young and active, so why do i have them? But it's just how the body works and really, it's nothing to worry about. Most people have cellulite and you dont even notice it on others. Apparently there are some types of creams or some form of massage which is supposed to help but i have never tried, i have learnt to not care as well!